In part 2 of our ongoing series on what makes a good bike trailer we’re going to look at cargo trailers. 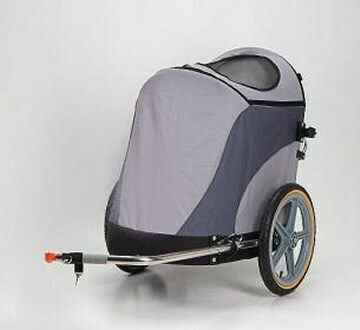 A cargo trailer can mean any number of things but for the purposes of this article it means a bike trailer that doesn’t carry people, pets, or boats. A cargo trailer can be used for lots of different purposes and it’s the sheer usefulness of these bike trailers that make them hard to classify. Because of this, picking a good one is even harder. While any box on wheels can probably do the trick, you likely don’t want a massive trailer if all you’re doing it getting a few bags of groceries. Be realistic here. If you’re going to be mostly hauling small cargo then get a smaller trailer and borrow a bigger one for bigger jobs. Properly assessing your cargo needs will also help you narrow down the features you need. If you’re using the trailer primarily for groceries, a cover makes a good deal of sense so your groceries don’t get rained on. You may also want something that quickly converts from bike trailer to grocery cart to avoid leaving your trailer outside and make things a little easier. Of course, if you’re primarily hauling heavy thing like paint and wood, a grocery getter is not for you. Look for something with a wide base and lots of room. A cover may or may not be a necessity for big loads like this. While a big trailer might appeal it may not be practical for your environment. Narrow streets and lot of turns might make you think twice about a wide and long trailer. It will turn out to be a balance between functionality and practicality when it comes to larger trailers. What’s my personal carrying capacity? Not everyone has legs of steel. Can you realistically pull your trailer under a full load? While you may be able to get a large pile of lumber in your trailer, it won’t mean much if you can’t actually move it anywhere. Of course, “full load” is something you’ll have to decide for yourself. A full load of gold bars (if you’re starting a bicycle Brinks) will be much harder to manage than a full load of, say, bread. Loads of over 125 lbs are very difficult to tow up steep hills. No matter what trailer works for you, keep in mind that quality matters. 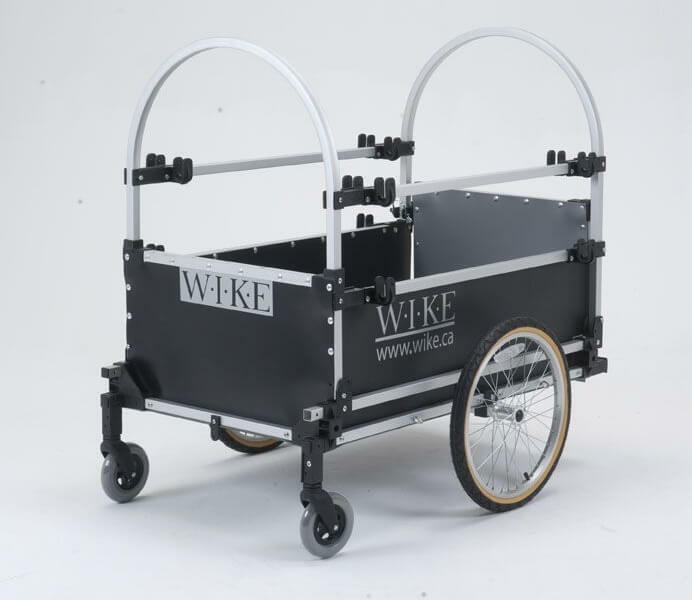 A good, strong set of wheels, a strong frame, and quality materials will make your cargo bike trailer a joy to use rather than something that will be falling apart in short order. And also give some consideration to replacement parts. Unlike child bike trailers, it’s likely that you’ll be using it for the long haul (ahem) so replacement parts will be important. The limit of carrying capacity depends on many things that are not a function of the rating of the trailer. The ability to start and stop the trailer with your bicycle is a primary concern. Because trailers do not have brakes it is important that the momentum of the trailer will not cause your bicycle to jack-knife when you brake. If you are standing on your peddles and brake quickly, most of your weight is transferred to the front wheel of your bicycle. This leaves little friction between the rear wheel and the road which, if you are towing a heavy load, will cause a jack-knife… especially if you are in a turn.